Data is defined as facts or figures, or information that’s stored in or used by a computer. The technological advancements and usage of smart devices in recent years has led to data revolution. More and more data is being produced by an increasing number of electronic devices by using the internet. The amount of data and the frequency at which data is growing is very vast. Due to this rapid data growth, the computation has become a big hindrance. To process this extensive data, we require a higher computational power that our traditional data processors fail to do. To have a glance over data growth, let's consider this analytics - we create 2.5 quintillion bytes of data a day according to IBM. To tackle this data processing problem, we need a solution which could solve all data-related issues. This led us to develop a software platform known as Hadoop. Today, Hadoop is helping us in solving the big data problems. Hadoop is an open-source software Platform for storing huge volumes of data and running applications on clusters of commodity software. It gives us the massive data storage facility, enormous computational power and the ability to handle different virtually limitless jobs or tasks. Its main core component is to support growing big data technologies, thereby support advanced analytics like Predictive analytics, Machine learning and data mining. Hadoop has the capability to handle different modes of data such as structured, unstructured and semi-structured data. It gives us the flexibility to collect, process, and analyze data that our old data warehouses failed to do. Hadoop ecosystem is a platform or framework which helps in solving the big data problems. It comprises of different components and services ( ingesting, storing, analyzing, and maintaining) inside of it. Most of the services available in the Hadoop ecosystem are to supplement the main four core components of Hadoop which include HDFS, YARN, MapReduce and Common. Hadoop ecosystem includes both Apache Open Source projects and other wide variety of commercial tools and solutions. Some of the well known open source examples include Spark, Hive, Pig, Sqoop and Oozie. As we have got some idea about what is Hadoop ecosystem, what it does, and what are its components, let’s discuss each concept in detail. Below mentioned are the concepts which all together can construct a Hadoop ecosystem. Let's get into the details without wasting much time. The Hadoop distributed file system is a storage system which runs on Java programming language and used as a primary storage device in Hadoop applications. HDFS consists of two components, which are Namenode and Datanode; these applications are used to store large data across multiple nodes on the Hadoop cluster. First, let’s discuss about the NameNode. 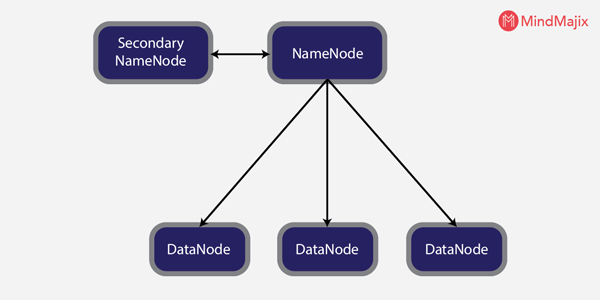 NameNode is a daemon which maintains and operates all DATA nodes (slave nodes). It acts as the recorder of metadata for all blocks in it, and it contains information like size, location, source, and hierarchy, etc. It records all changes that happen to metadata. If any file gets deleted in the HDFS, the NameNode will automatically record it in EditLog. NameNode frequently receives heartbeat and block report from the data nodes in the cluster to ensure they are working and live. It acts as a slave node daemon which runs on each slave machine. The data nodes act as a storage device. It takes responsibility to serve read and write request from the user. It takes the responsibility to act according to the instructions of NameNode, which includes deleting blocks, adding blocks, and replacing blocks. It sends heartbeat reports to the NameNode regularly and the actual time is once in every 3 seconds. It works at the cluster level and takes responsibility oforrunning the master machine. It stores the track of heartbeats from the Node manager. It takes the job submissions and negotiates the first container for executing an application. It consists of two components: Application manager and Scheduler. It works on node level component and runs on every slave machine. It is responsible for monitoring resource utilization in each container and managing containers. It also keeps track of log management and node health. It maintains continuous communication with a resource manager to give updates. MapReduce acts as a core component in Hadoop Ecosystem as it facilitates the logic of processing. To make it simple, MapReduce is a software framework which enables us in writing applications that process large data sets using distributed and parallel algorithms in a Hadoop environment. Parallel processing feature of MapReduce plays a crucial role in Hadoop ecosystem. It helps in performing Big data analysis using multiple machines in the same cluster. In the MapReduce program, we have two Functions; one is Map, and the other is Reduce. Map function: It converts one set of data into another, where individual elements are broken down into tuples. (key /value pairs). Reduce function: It takes data from the Map function as an input. Reduce function aggregates & summarizes the results produced by Map function. Apache Spark is an essential product from the Apache software foundation, and it is considered as a powerful data processing engine. Spark is empowering the big data applications around the world. It all started with the increasing needs of enterprises and where MapReduce is unable to handle them. The growth of large unstructured amounts of data increased need for speed and to fulfill the real-time analytics led to the invention of Apache Spark. It is a framework for real-time analytics in a distributed computing environment. It acts as an executor of in-memory computations which results in increased speed of data processing compared to MapReduce. It is 100X faster than Hadoop while processing data with its exceptional in-memory execution ability and other optimization features. Spark is equipped with high-level libraries, which support R, Python, Scala, Java etc. These standard libraries make the data processing seamless and highly reliable. Spark can process the enormous amounts of data with ease and Hadoop was designed to store the unstructured data which must be processed. When we combine these two, we get the desired results. Apache Hive is a data warehouse open source software built on Apache Hadoop for performing data query and analysis. Hive mainly does three functions; data summarization, query, and analysis. Hive uses a language called HiveQL( HQL), which is similar to SQL. Hive QL works as a translator which translates the SQL queries into MapReduce Jobs, which will be executed on Hadoop. Metastore- It serves as a storage device for the metadata. This metadata holds the information of each table such as location and schema. Metadata keeps track of data and replicates it, and acts as a backup store in case of data loss. Driver- Driver receives the HiveQL instructions and acts as a Controller. It observes the progress and life cycle of various executions by creating sessions. Whenever HiveQL executes a statement, driver stores the metadata generated out of that action. Compiler- The compiler is allocated with the task of converting the HiveQL query into MapReduce input. A compiler is designed with the process to execute the steps and functions needed to enable the HiveQL output, as required by the MapReduce. Hbase is considered as a Hadoop database, because it is scalable, distributed, and because NoSQL database that runs on top of Hadoop. Apache HBase is designed to store the structured data on table format which has millions of columns and billions of rows. HBase gives access to get the real-time data to read or write on HDFS. HBase is an open source, NoSQL database. It is featured after Google’s big table, which is considered as a distributed storage system designed to handle big data sets. It has a unique feature to support all types of data. With this feature, it plays a crucial role in handling various types of data in Hadoop. The HBase is originally written in Java, and its applications can be written in Avro, REST, and Thrift APIs. There are majorly two components in HBase. They are HBase master and Regional server. a) HBase master: It is not part of the actual data storage, but it manages load balancing activities across all RegionServers. Performs administration activities which provide an interface for creating, updating and deleting tables. It maintains and monitors the Hadoop cluster. 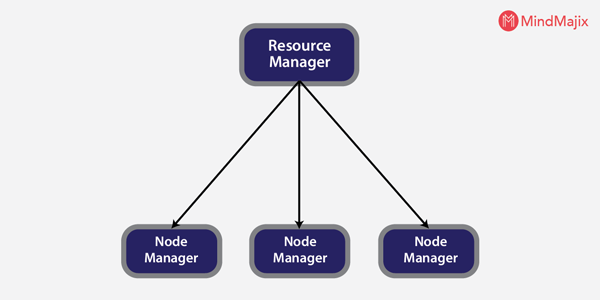 b) Regional server: It is a worker node. It reads, writes, and deletes request from Clients. Region server runs on every node of Hadoop cluster. Its server runs on HDFS data nodes. H Catalogue is a table and storage management tool for Hadoop. It exposes the tabular metadata stored in the hive to all other applications of Hadoop. 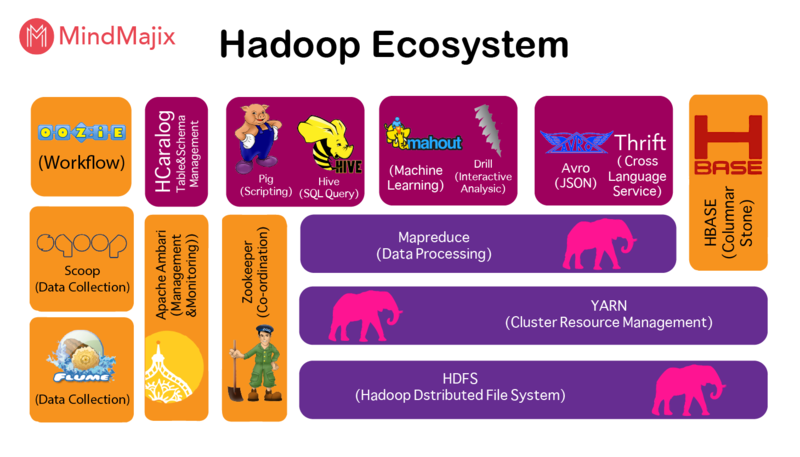 H Catalogue accepts all kinds of components available in Hadoop such as Hive, Pig, and MapReduce to quickly read and write data from the cluster. H Catalogue is a crucial feature of Hive which allows users to store their data in any format and structure. H Catalogue defaulted supports CSV, JSON, RCFile,ORC file from and sequenceFile formats. It assists the integration with the other Hadoop tools and provides read data from a Hadoop cluster or write data into a Hadoop cluster. It allows notifications of data availability. It enables APIs and web servers to access the metadata from hive metastore. It gives visibility for data archiving and data cleaning tools. Apache Pig is a high-level language platform for analyzing and querying large data sets that are stored in HDFS. Pig works as an alternative language to Java programming for MapReduce and generates MapReduce functions automatically. Pig included with Pig Latin, which is a scripting language. Pig can translate the Pig Latin scripts into MapReduce which can run on YARN and process data in HDFS cluster. Pig is best suitable for solving complex use cases that require multiple data operations. It is more like a processing language than a query language (ex:Java, SQL). Pig is considered as a highly customized one because the users have a choice to write their functions by using their preferred scripting language. We use ‘load’ command to load the data in the pig. Then, we can perform various functions such as grouping data, filtering, joining, sorting etc. At last, you can dump the data on a screen, or you can store the result back in HDFS according to your requirement. Sqoop works as a front-end loader of Big data. Sqoop is a front-end interface that enables in moving bulk data from Hadoop to relational databases and into variously structured data marts. Sqoop replaces the function called ‘developing scripts’ to import and export data. It mainly helps in moving data from an enterprise database to Hadoop cluster to performing the ETL process. Apache Sqoop undertakes the following tasks to integrate bulk data movement between Hadoop and structured databases. Sqoop fulfills the growing need to transfer data from the mainframe to HDFS. Sqoop helps in achieving improved compression and light-weight indexing for advanced query performance. It facilitates feature to transfer data parallelly for effective performance and optimal system utilization. 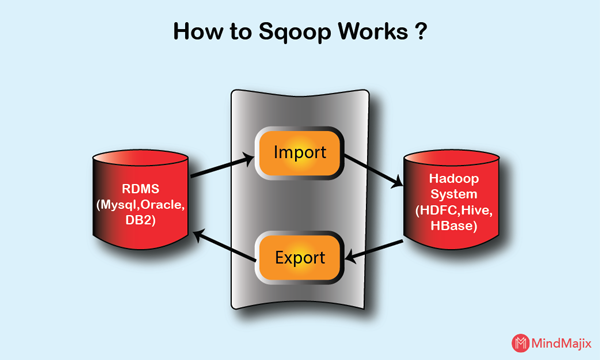 Sqoop creates fast data copies from an external source into Hadoop. It acts as a load balancer by mitigating extra storage and processing loads to other devices. Apache Ooze is a tool in which all sort of programs can be pipelined in a required manner to work in Hadoop's distributed environment. 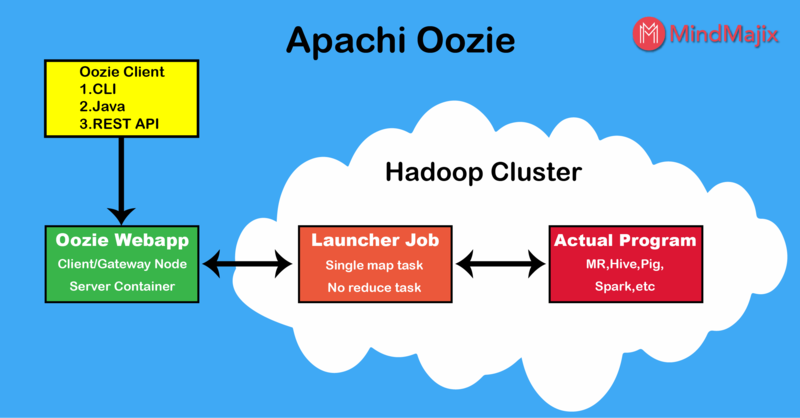 Oozie works as a scheduler system to run and manage Hadoop jobs. Oozie allows combining multiple complex jobs to be run in a sequential order to achieve the desired output. It is strongly integrated with Hadoop stack supporting various jobs like Pig, Hive, Sqoop, and system-specific jobs like Java, and Shell. Oozie is an open source Java web application. 1. Oozie workflow: It is a collection of actions arranged to perform the jobs one after another. It is just like a relay race where one has to start right after one finish, to complete the race. 2. Oozie Coordinator: It runs workflow jobs based on the availability of data and predefined schedules. Apache Avro is a part of the Hadoop ecosystem, and it works as a data serialization system. It is an open source project which helps Hadoop in data serialization and data exchange. Avro enables big data in exchanging programs written in different languages. It serializes data into files or messages. Avro Schema: Schema helps Avaro in serialization and deserialization process without code generation. Avro needs a schema for data to read and write. Whenever we store data in a file it’s schema also stored along with it, with this the files may be processed later by any program. Dynamic typing: it means serializing and deserializing data without generating any code. It replaces the code generation process with its statistically typed language as an optional optimization. Avro makes Fast, compact, dynamic data formats. It has Container file to store continuous data format. It helps in creating efficient data structures. The primary purpose of Hadoop ecosystem is to process the large sets of data either it is structured or unstructured. Apache Drill is the low latency distributed query engine which is designed to measure several thousands of nodes and query petabytes of data. The drill has a specialized skill to eliminate cache data and releases space. It gives an extensible architecture at all layers. Drill provides data in a hierarchical format which is easy to process and understandable. The drill does not require centralized metadata, and the user doesn’t need to create and manage tables in metadata to query data. 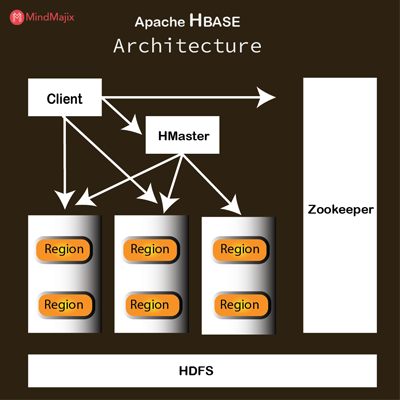 Apache Zookeeper is an open source project designed to coordinate multiple services in the Hadoop ecosystem. Organizing and maintaining a service in a distributed environment is a complicated task. Zookeeper solves this problem with its simple APIs and Architecture. Zookeeper allows developers to focus on core application instead of concentrating on a distributed environment of the application. Zookeeper acts fast enough with workloads where reads to data are more common than writes. Zookeeper acts as a disciplined one because it maintains a record of all transactions. Flume collects, aggregates and moves large sets of data from its origin and send it back to HDFS. It works as a fault tolerant mechanism. It helps in transmitting data from a source into a Hadoop environment. Flume enables its users in getting the data from multiple servers immediately into Hadoop. Ambari is an open source software of Apache software foundation. It makes Hadoop manageable. It consists of a software which is capable of provisioning, managing, and monitoring of Apache Hadoop clusters. Let's discuss each concept. Hadoop cluster provisioning: It guides us with a step-by-step procedure on how to install Hadoop services across many hosts. Ambari handles configuration of Hadoop services across all clusters. Hadoop Cluster management: It acts as a central management system for starting, stopping and reconfiguring of Hadoop services across all clusters. Hadoop cluster monitoring: Ambari provides us with a dashboard for monitoring health and status. The Ambari framework acts as an alarming system to notify when anything goes wrong. For example, if a node goes down or low disk space on node etc, it intimates us through notification. We have discussed all the components of the Hadoop Ecosystem in detail, and each element contributes its share of work in the smooth functioning of Hadoop. Every component of Hadoop is unique in its way and performs exceptional functions when their turn arrives. To become an expert in Hadoop, you must learn all the components of Hadoop and practice it well. Hope you gained some detailed information about the Hadoop ecosystem. Happy learning!